A Council Bluffs man was arrested on Thursday for, among other things, throwing a large, plastic playhouse at a Council Bluffs police officer. 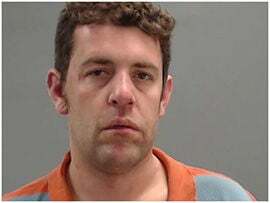 Joseph Stoddard, 34, was taken into custody shortly after midnight on Friday on suspicion of twice violating a no-contact order, second-degree burglary, disorderly contact, interference with official acts and three counts of assaulting a police officer. On Thursday night, Stoddard was found destroying items and throwing clothing outside a residence of a 32-year-old woman on the 3100 block of South 20th Street. Stoddard was not allowed to be at the residence after he was arrested on Sept. 21 for burglary at the victim’s residence. When police showed up on Thursday night, Stoddard would not allow the officers inside. Once inside, Stoddard threw the playhouse in order to escape. The officer was not treated for injuries. A second officer at the scene called for more help and Stoddard was apprehended. During the arrest, police officers used a stun gun on Stoddard. Stoddard remains in custody at Pottawattamie County Jail with bond set at $15,000. The three assault charges against Stoddard are Class D felonies. The second-degree burglary charge is a Class C felony. The other charges are misdemeanors. If convicted of the most serious offense, the Class C felony, Stoddard could receive a sentence of up to 10 years in jail and a fine of up to $10,000.